The color of honey, softest deer suede against your skin, once you put it on you won't want to take it off. It is supple, simple, and elegant. Completely hand laced with German Silver concho style button closers make this a dress or a coat to wear over jeans and skirts. The sleeves are trimmed in the same buttons as the front. A braided leather tie belt is attached with a copper hammered art coin. Sized small, medium or large. Call for available sizes in stock, may be custom ordered. $1,150. 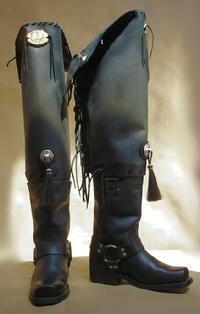 Hand laced leather boots re-adaptation in the spirit of the American West. 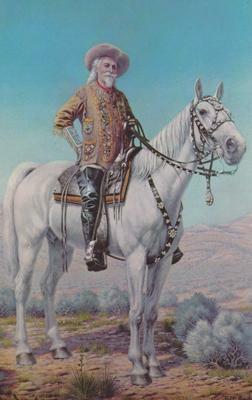 Inspired by the Great Impresario, Buffalo Bill and his Wild West Show. Ingredients include; leather, hand lacing, silver conchos with horse hair tassels, metal Concho trims on sides of boot, dimes and other trinkets that make tinkle sounds when you walk. Limited size run, order one size smaller than your normal size. Call for available sizes left. $625.